The location was orginially a country western bar. Then it became Visions, when its owners moved into twon from West Fourth Street. It was Reveille Again , Neutron and Tronix,. 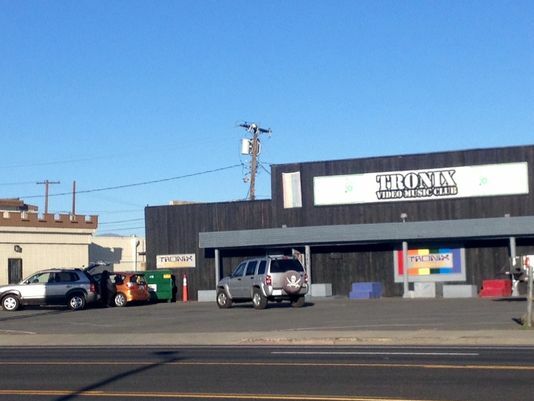 Tronix Video Music Nightclub has closed its doors, hosting a “Last Call” party on Monday, February 23 after opening across the street 11 years ago as Reno’s first “gay” video music club. It featured 24 different screens where music videos played in March 2004 when it opened. It moved to it present location when Neutron closed. Both clubs were owned by Michael Tierney. Facebook and Twitter lit up following the announcement of last call One post said, “I bet’cha the Religious Right had something to do with its closing…if their singin’ n dancin’ bout it tomorrow they will of implicated themselves.” Another simply said, “It is sad”. “The end of an era,” another quipped. One of the original owners of Carl’s said there were “10 gay bars in town when it opened and now there are two.” Many in the community were sadden at the news. The closing of Tronix did not come as a surprise. There had been rumors circulating for a while. The national trend has been the slow death of gay bars, as one by one they close. The bar “culture”, as it is known, came into existence because the bars were where people met, socialized, exchanged information, and hosted events. That is not needed any more. “After 11 years in business serving the LGBT community and acting as a home to nonprofit organizations and special events it is with a heavy heart that our LGBT community says goodbye to Tronix Nightclub located at 340 Kietzke Lane in Reno,” was a simply statement issued in a press release. It cited a huge drop in sales and a reduction in patrons do to not having a wall to separate the 18-20 year old as required by the City of Reno as contributing to the closing. Tronix closing puts in limbo where the Silver Dollar Court can host their drag shows. Since the Ten99 Club closed, the community has not had a drag or real show bar. Tronix stepped up and became the host of many of the charity organization’s shows and events. There are no gay show bars in Reno any longer. The 5 Star in downtown Reno has a small stage. The closing also puts in limbo where the annual Easter Trannyshack Show can be held. Heklina and Company charter buses bringing over 100 people to the Biggest Little City for a wild and crazy “get away” weekend. The performance art group has been doing the annual trek the past 17 years. There is no word yet about Trannyshack 2015 which would be the weekend of April 4/5. Tronix joins a long list of gay bars in Reno which have have closed their doors. The Ten99 Club closed in June of 2011, it had been opened for over 40 years. Other gay bars that have come and gone were Reveille Again, Visions, Neutron, Bar West, More West, Reflections, The Chute, Shouts, Ron’s Piano Bar, The Quest, The Alley Club, Blue Cactus, Phase 2, The Hub, The Rumpus Room and Bad Dolly’s. There are many more. There were a lot of gay bars in Reno at one time. Now the national trend is being seen in the Biggest Little City too. Slowly “gay” bars are heading the way of the dinosaur, extinction. Will that actually happen is unclear. One local bar owner said they will never go away, when the Reno Gay Page published a story about gay bars in 2010. “They won’t go away. There will always be a need for a gay bar,” they said. Several in the community said there will also be a need for a community bar, just likely not what “gay bars” had always been before the closet door was ripped off and gay people were more accepted. Christopher Daniels, a local playwright and member of the Utility Players, is in the process of writing and refining a story about “Gay Bars” that will be produced at Good Luck MacBeth Theatre, Daniels says the play, Last Call at the Old Southwest, “explores two characters, drag queen Mother Mary, and Hunter Samuels, through 30 years of the LGBT movement. The LGBT Bar and bar culture is dying and the piece explores why that is and if it is ultimately good for the community. The bar used to the central nexus of LGBT culture, politics, and information. How/where the stories about the heritage, culture, and history of our community were being passed down.” The play should debut in July. Reno does still have bars that identify as being “gay”; The Patio, a gathering place, is on West Fifth Street open daily 11am to 2 am; The Cadillac Lounge, on East Fourth Street open daily 12noon to 2am; Carls – The Saloon, on South Virginia near the Peppermill is open daily 2pm to 2am and The 5 Star Saloon, on West Street in Downtown Reno, is open 5pm to 4am daily. The Reno Gazette Journal reported the press release indicated there was interest from a San Francisco Bay Area Club owner who expressed interest in possibly acquiring the lease for what is now the former location of Tronix, Neutron and Visions. The idea is to bring a state of the art gay nightclub to the area with the help of Vanity Entertainment, a local gay promotion company.